Gently undulating dunes mark this nine-hole course. Nine holes strategically placed around picturesque water bodies. 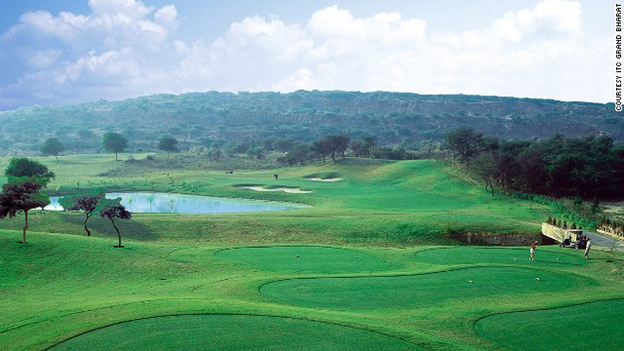 A nine-hole course, surrounded by a spectacular craggy canyon space, with breathtaking views of the Aravalis. The appeal of a game here is that it may be played at a leisure pace and yet with focus, entirely conducive to an immersive experience. Resident Guests can enjoy the thrills and charm of the game which our concierge will be delighted to organize. 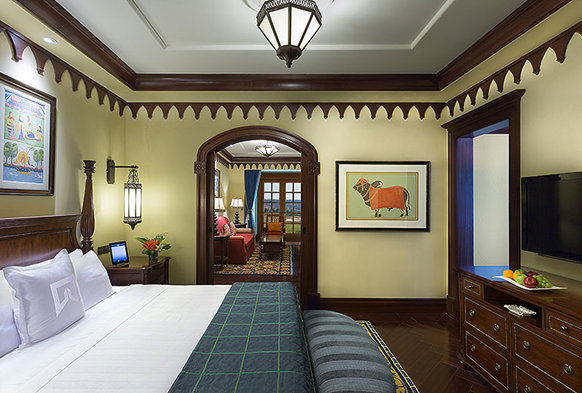 The 100 Deluxe Suites at ITC Grand Bharat offer warm interiors of vibrant Indian colours and showcase Indian craftsmanship in the details of the woodwork, rich fabric and handmade customized appointments. Soothing marble and rich engineered wooden flooring inter-spaced with hand tufted carpets enhance the experience of these 70 m2 Suites. The living room, bedroom and bathroom are all private spaces which are compartmentalized by sliding doors, thus ensuring privacy and yet providing the atmospherics of an elegantly appointed residence. A traditional divan by the bedroom window serves as an inviting reading nook. The 300 thread count linen sheets and our Signature Welcome Slumber kit compliment ITC Hotels’ promise of enhanced and undisturbed sleep. The walk in wardrobe adjoins a luxurious marble bathroom. The resort host (butler) will always be available to attend to your every need, while remaining unobtrusive and ensuring your privacy. The graceful and elegant sunlit living rooms lead to a private sit out deck by an inviting, semi private, cobalt blue, dip pool. The private terrace offers a picturesque view of the scenic environs and can be customized for intimate gatherings and dinners. The Presidential Villas, spread over 532 m2, will redefine opulence and elegance. 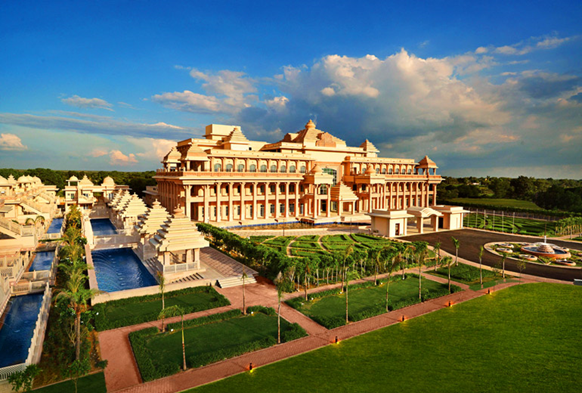 With a fleet of service-associates in attendance round the clock, and a host of lavish and regal services, the Presidential Villas, themed after four dynasties of India - Maurya, Maratha, Mughal and Chola, offer an unmatched luxury experience. India, the birthplace of yoga, ayurveda, and meditation, attracts millions of tourists from across the globe, who come to discover the magical charms of the various traditional aromatic and therapeutic massages, treatments and rituals of this land and rejuvenate their senses. ITC Grand Bharat captures this very essence of India and will offer guests a vast range of holistic well being and health services. It is not just a resort; but is a wellness destination that helps in revitalizing the body, mind and spirit, through its traditional Indian therapies and solutions. In this island of tranquility, time slows down to accommodate one’s need to reflect on the finer aspects of life. Guests can discover the beauty that lies in the detail and fulfill their desire to spend time with their loved ones and connect with their inner self at this oasis of wellness. Leave behind the essence of time with therapeutic and aromatic massages at Kaya Kalp - The Royal Spa. Rediscover the magic of togetherness at the Yoga Pavilion and gratify your senses with the holistic swasthya cuisine. NOTE: Kaya Kalp - The Royal Spa, is not operational as of now. However, there are 3 spa suites available for treatments as an interim measure & will be operational between 0900 hours to 2000 hours daily. The resort concierge can be contacted for reservations. ITC Hotels' internationally acclaimed indigenous spa ‘Kaya Kalp -The Royal Spa’ finds residence at ITC Grand Bharat, covering an area of 1,951 m2 with nine therapy rooms, including a couple suite. Kaya Kalp, a Sanskrit word, meaning rejuvenation of mind, body and soul. This luxurious spa is a haven for holistic well being and sumptuous pampering. It offers a unique and delightful menu of therapies from across the world, in an ambiance that emanates tranquility. An unceasing body of water surrounding the resort accentuates the healing process, while lending an air of tranquility to the rich surrounds. ‘Swasthya’, a Sanskrit term, goes beyond the definition of health perceived in a medical sense. In essence, it refers to external and internal well being, focusing on healing not just the body but also the intangible elements of the mind and the spirit. Wellbeing is about eating well – not frugally, but wholeheartedly. At ITC Grand Bharat, well being kitchens have re-imagined the finest cuisines that will go beyond European flavors and reconstruct low calorie gourmet experiences infusing the flavors of Asia, to meet the wellness needs of ‘sirath’ (external self) and ‘surath’ (internal self). The cuisine is about deconstructing traditional recipes and re-imagining them by lowering the calorie count substantially. Appropriate food combinations are prepared to aid wel lbeing. Ayurveda also advocates a similar approach to one’s diet. Guests can savor the healing benefits of ‘swasthya’ cuisine at the resort, which is carefully combined with other cuisine options. A 130 m2 of world class fitness center at the resort offers various fitness routines such as yoga and more with personal attention provided by qualified instructors. Guests can avail a comprehensive yoga regimen under the able guidance of expert instructors and discover a completely new fun way of staying fit and healthy. Ayurvedic therapies and naturopathy will also be available at the resort. 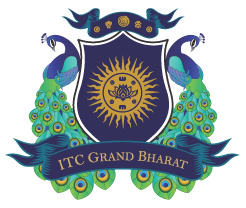 ITC Grand Bharat offers a gamut of leisure activities for guests to savour at an unhurried pace. Guests may rediscover themselves, develop camaraderie, rekindle the old flame, relive the passion, celebrate moments of togetherness, experience life, and discover the magic of getting lost in time –all this and a lot more in an environment of opulence and sumptuousness. Few can boast about revelling in a luxury holiday around the edges of a signature Golf course. 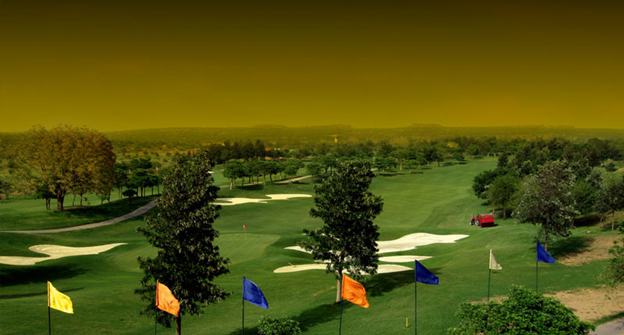 Delight in a spectacular game of golf and take back fond memories of a rich holiday experience. 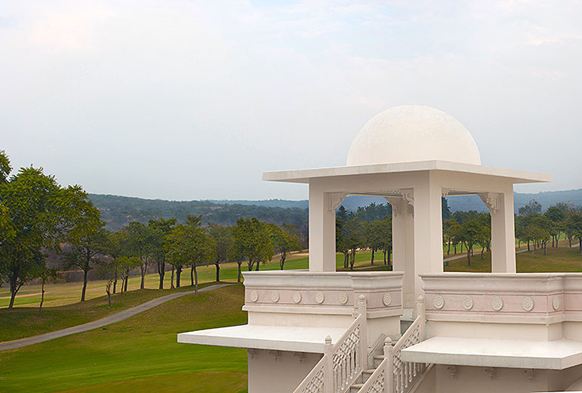 The Aravali Range offers an environment conducive to leisure sports such as rappelling, segways, ATV ride and zorbing, hiking, nature walks, mountain biking/cycling, and rock climbing. These activities can be organised on request and will be conducted under the guidance of trained instructors. One can trace pathways that meander through verdant surroundings, go on an expedition with family and friends, and breathe in the refreshing air of the unspoiled surrounds. The Aravali Range is an ornithologist’s paradise. The unique bio-diversity of this region makes it a favoured spot for migratory birds like the Golden Oriole, Eurasian Wryneck, Oriental Honey Buzzard and the Black Shouldered Kite etc., offering the wonderful opportunity to spot these rare and unique species. The smooth cycling tracks allow guests to go on tandem rides with family and friends. Cycling gear is available on request. Sports enthusiasts can get their adrenaline pumping by indulging in activities like swimming, volleyball, tennis, squash/volley ball, badminton, among others. Arranged on-request, guests can enjoy a leisurely picnic in the natural environs of the resort. Feast your eyes to the ubiquitous flora and fauna that dot the expansive resort. Special picnic hampers of fruits, sandwiches and other goods paired with the freshest beverages, can be arranged on request for a wholesome and fun-filled outing. ITC Hotels’ tradition of culinary excellence is reflected in its well-researched cuisine concepts that enumerate the chain’s endeavors to present the ‘Globe’s Best Indian Cuisine and India’s Finest Global Cuisine’. With ‘Responsible Luxury’ at its core, ITC Hotels ensures responsible sourcing of the best ingredients. A holistic culinary philosophy underscores a ‘well-being’ approach and caters to the discerning palate of the evolved traveler. The tradition continues at ITC Grand Bharat with unique gourmet experiences orchestrated by the culinary team, with a ‘Well-Being’ chef at its helm. Offering some of the finest cuisines of the world - from Swasthya cuisine to Breakfasts of the World, from signature ‘Best of Pavilion’ menu to ‘Modern Indian Mosaics’, guests will be spoiled for choice in this 3-meal period restaurant. Modern Indian Mosaics at Aravali Pavilion promises to be a unique culinary movement that puts Indian flavors at home with the world; and global flavors at home with India. It marks the coming of age of a unified Indian cuisine – a modern culinary anthem re-imagined with a blend of ancient and futuristic techniques in sync with international trends and the evolving global milieu. Savor delicious dishes and al fresco dining, as this restaurant will serve tapas style plates and will have an inbuilt counter serving hot pressed sandwiches, steaks and wraps. It will also house a mobile bar for coffee, tea, wine and beer. In the warm and cheerful ambiance of this restaurant, guests can sit back and relish not just the fine flavors of the fare but also develop unforgettable bonds of camaraderie and companionship. The offerings in this restaurant are inspired from the various colonizers from India’s past. At the heart of this depiction lies a confluence of fine European cuisine, that envisage a common pool of European fine dining. The menu boasts of a vast array of cuisines of the colonizers of India – from the Greeks, the Portuguese, the Dutch, the French, to the British. A lounge by the poolside that epitomizes the ‘unhurried luxury’ philosophy of the resort. It offers a collage of ‘slow’ plates and grills complimented by artisan and craft beverages, Apas Promenade will be the first Indian outpost of the celebrated Slow Food movement by Terra Madre, a community dedicated to creating responsible cuisine. The breakfast selection is inspired from favorites around the globe and includes hearty exceptional produce, free range eggs, Indian super grains and farm to glass vitalisers in addition to eco-gastronomy inspired cuisine, zero kilometer offerings and slow grills. Inspired by the national bird of India, Peacock Bar will offer Molecular Mixology inspired Classic Cocktails and premium spirits from across the world including mature malts, fine wines, exotic champagnes and much more. * The theatrics of the mixologist blend with the gentle jazz strains, abetting the energy of the bar. Guests can enjoy the stillness of time, in the company of their loved ones, while satiating their palate with the finest drinks from around the world. *NOTE: The Peacock Bar will serve soft beverages & gourmet mocktails until further advised. ITC Grand Bharat, India’s first all-suite one-of-a-kind destination luxury resort, is an epitome of fine living and fine dining. It symbolizes the concept of ‘Bharatvarsh’, encompasses the essence of India and brings to life myriad facets of the great nation through its architecture, interiors, services, cuisine, decor, and ambience. The resort is designed in the form of a ‘mandala’, or a circle, representing completeness. It is symbolic of a cosmic diagram, reflecting the relation of life with the infinite. In this island of tranquility, time slows down to accommodate one's need to reflect on the finer things in life.